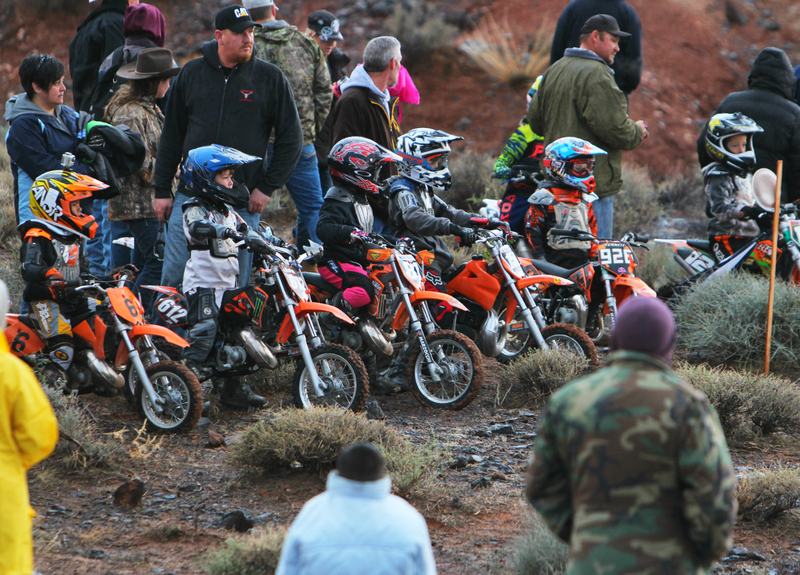 LITTLEFIELD, Arizona — A few miles south of Washington City near the Utah/Arizona border, motocross riders filled their tanks, prepped their bikes and geared up for the 32nd annual Rhino Rally early Friday morning. Despite the drizzling rain and chilly temperatures, close to 300 riders took to the starting line for the “Big Bike Race” portion of the event, which consisted of two 30-mile loops along a desert course. 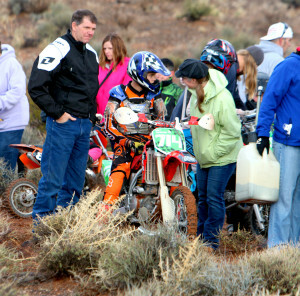 A small crowd of spectators, mostly family and friends of the riders, gathered along the edge of the race to cheer on the novice, amateur and expert waves of participants as they took off and quickly disappeared into the desert terrain. Because of the rain, the ground was damp and less likely to kick up dust. Dust can be a dangerous factor in desert racing, as it affects visibility. The Wizards Motorcycle Club is the driving force behind the event, with members volunteering time and effort out of love for the sport and the racing community. When it comes to where the race got its quirky name, Snow said the details of the event’s origins have been lost to time, but he believes the original founders of the Rhino Rally named it after a speedway race in a foreign country. 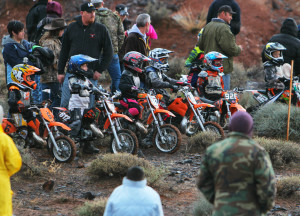 Additional races that took place in the morning were the “Pee Wee Race,” a 20-minute race on a small track for kids, and a “Mini Bikes Race,” which was a 12-mile loop. While there was a decent sized crowd at the rally, this event is not a spectator sport. 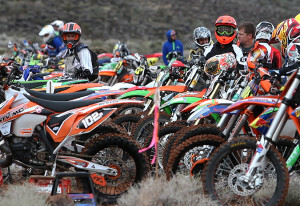 Rider registration typically fills up quickly, Snow said, as the event continues to grow in popularity. An awards ceremony began at 7 p.m. Saturday at the Abbey Inn in St. George, complete with drawings and prizes for the participants.